مدل آماری رویه پاسخ، با انجام طراحی مرکزی ترکیبی باعث بهینه‌سازی فرایندها تولید می‌شود. از طرف دیگر حذف ترکیبات دارویی قبل از تخلیه به محیط زیست امری ضروری است. هدف از این مطالعه،‌بهینه‌سازی حذف ترکیب دارویی سیپروفلوکساسین با فرایند انعقاد الکتروشیمیایی با مدل آماری رویه پاسخ از محیط آبی بود. 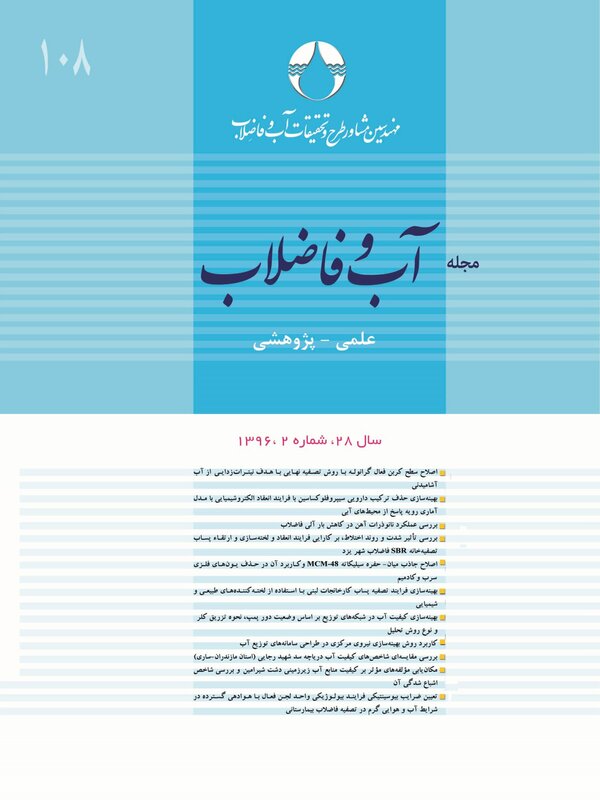 در این مطالعه، از یک راکتور به‌همراه دو الکترود آهن به‌عنوان آند و دو الکترود تیتانیم به‌عنوان کاتد استفاده شد. الکترودها به‌صورت مونوپلار به دستگاه جریان مستقیم وصل بودند. پارامترهای pH در محدوده 4 تا 8، جریان 5/0 تا 5/1 آمپر DC، غلظت سیپروفلوکساسین 15تا40 میلی‌گرم در لیتر و زمان واکنش 15 تا 30 دقیقه به‌عنوان پارامترهای اصلی طراحی با نرم‌افزارDesign Expert لحاظ شدند. آنالیز FT-IR، تصاویر SEM، میزان حذف COD و تغییرات ایجاد شده در طیف UV- VIS در شرایط بهینه تعیین شد. نتایج مدل‌سازی، بازده 91/85 درصدی به ازای غلظت اولیه سیپروفلوکساسین برابر 15 میلی‌گرم در لیتر در pH برابر 68/7 ، جریان مستقیم الکتریکی برابر 50/1 آمپر و زمان واکنش برابر 30 دقیقه را به‌عنوان بهترین شرایط آزمایش مشخص نمود. میزان حذف COD در این شرایط 64 درصد به‌دست آمد. نتایج به‌دست آمده بر اساس آنالیز FT-IR و تصاویر SEM نشان دهنده انجام تغییرات در طی فرایند است. اسکن طول موج نیز نشان دهنده کاهش غلظت و معدنی‌سازی آلاینده است. بهینه‌سازی با مدل آماری رویه پاسخ باعث کاهش تعداد آزمایش‌ها و افزایش دقت ‌شد. فرایند انعقاد الکتروشیمیایی دارای کارایی مناسبی در حذف سیپروفلوکساسین و COD می‌باشد و می‌توان از این فرایند برای کاهش بار آلودگی فاضلاب قبل از ورود به محیط استفاده کرد. Abu Hasan, H., Rozaimah Sheikh Abdullah, S., Kartom Kamarudin, S. & Tan Kofli, N., 2011, "Response surface methodology for optimization of simultaneous COD, NH4+–N and Mn2+ removal from drinking water by biological aerated filter", Desalination, 275(1), 50-61. Ahmed, M.G., Harish, N.M., Charyulu, R.N. & Prabhu, P., 2009, "Formulation of chitosan-based ciprofloxacin and diclofenac film for periodontitis therapy", Tropical Journal of Pharamaceutical, 8(1), 33-41. Aoudj, S., Khelifa, A., Drouiche, N., Hecini, M. & Hamitouche, H., 2010, "Electrocoagulation process applied to wastewater containing dyes from textile industry", Chemical Engineering Research Design, 49(11), 1176-1182. APHA., AWWA., WEF., 2012, Standard methods for the examination of water and wastewater, 22nd Ed., USA. Can, O., 2014, "COD removal from fruit-juice production wastewater by electrooxidation electrocoagulation and electro-Fenton processes", Desalination Water Treatment, 52(1-3), 65-73. Carabineiro, S., Thavorn-Amornsri, T., Pereira, M. & Figueiredo, J., 2011, "Adsorption of ciprofloxacin on surface-modified carbonmaterials", Water Research, 45, 4583-4591. Choi, K.J., Kim, S.G. & Kim, S.H., 2008, "Removal of antibiotics by coagulation and granular activated carbon filtration", J. Hazardous Materials, 151(1), 38-43. Choi, K.J., Son, H.J. & Kim, SH., 2007, "Ionic treatment for removal of sulfonamide and tetracycline classes of antibiotic", Science Total Environmental, 387(1), 247-256. Crisafully, R., Aparecida, M., Cavalcante, R.M., Silveira, E.R., Keukeleire, D.D. & Nascimento, R.F., 2008. "Removal of some polycyclic aromatic hydrocarbons from petrochemical wastewater using low-cost adsorbents of natural origin.” Bioresource Technology, 99(10), 4515-4519. Daneshvar, N., Oladegaragoze, A., and Djafarzadeh, N., 2006, "Decolorization of basic dye solutions by electrocoagulation: An investigation of the effect of operational parameters", Journal Hazardous Materials, 129(1), 116-22. Dimitrakopoulou, D., Rethemiotaki, I., Frontistis, Z., Xekoukoulotakis, N., Venieri, D. & Mantzavinos, D., 2012, "Degradation, mineralization and antibiotic inactivation of amoxicillin by UV-A/TiO2 photocatalysis", Journal Environmenal Management, 98,168-170. Farhadi, S., Aminzadeh, B., Torabian, A., Khatibikamal, V. & Alizadeh Fard, M., 2012, "Comparison of COD removal from pharmaceutical wastewater by electrocoagulation, photoelectrocoagulation, peroxi-electrocoagulation and peroxi-photoelectrocoagulation processes", Journal Hazardous Materials, 219, 35-42. Garcia-Garcia, A., Martinez-Miranda, V., Ivan, G., Cienfuegos, M., Tatiana, P., Sanchez, A., et al., 2014, "Industrial wastewater treatment by electrocoagulation–electrooxidation processes powered by solar cells", Fuel, 149, 46-54. Guinea, E., Brillas, E., Centellas, F., Canizares, P., Rodrigo, M. & Saez, C., 2009, "Oxidation of enrofloxacin with conductive-diamond electrochemical oxidation, ozonation and fenton oxidation", Water Reserach, 43(8), 2131-2138. Hernando, M.D., Mezcua, M., Fernández-Alba, A.R. & Barcelo, D., 2006, "Environmental risk assessment of pharmaceutical residues in wastewater effluents, surface waters and sediments", Talanta, 69(2), 334-342. Imran, A., Vinod, K., Tabrez, A. & Asim, M., 2012, "Removal of arsenate from aqueous solution by electro-coagulation method using Al-Fe electrodes", International Journal Electrochemical Sciences, 7, 1898-1907. Kobya, M., Demirbas, E., Can, O.T. & Bayramoglu, M., 2006, "Treatment of levafix orange textile dye solution by electrocoagulation", Journal Hazardous Materials, 132(2),183-188. Ölmez, T., 2009, "The optimization of Cr(VI) reduction and removal by electrocoagulation using response surface methodology", Journal Hazardous Materials, 162,1371-1378. Rozas, O., Contreras, D., Mondaca, M., Pérez-Moya, M. & Héctor, D., 2010, "Experimental design of fenton and photo-fenton reactions for the treatment of ampicillin solutions", Journal Hazardous Materials, 177(1), 1025-1030. Şengil, İ.A. & Özacar, M., 2009, "The decolorization of CI Reactive Black 5 in aqueous solution by electrocoagulation using sacrificial iron electrodes", Journal Hazardous Materials, 161(2), 1369-1376. Shannag, M., Al-Qodah, Z., Bani-Melhem, Kh., Rasool Qtaishat, M. & Alkasrawi, M., 2014, "Heavy metal ions removal from metal plating wastewater using electrocoagulation: Kinetic study and process performance", Chemical Engineering Journal,260, 749-756. Xu, H., Yang, Zh., Zeng, G, Luo, Y., Huang, J., Wang, Li., Song, P. & Mo, X., 2014, "Investigation of pH evolution with Cr (VI) removal in electrocoagulation process: Proposing a real-time control strategy", Chemical Enginering Journal, 239, 132-140. Zeng, Z., Zou, H., Li, X., Sun, B., Chen, J. & Shao, L., 2012, "Ozonation of acidic phenol wastewater with O3/Fe (II) in a rotating packed bed reactor: Optimization by response surface methodology", Chemical Engineering Research and Design, 60, 1-8. Zhang, X., Zhang, Y., Zhao, H., He, Y., Li, X. & Yuan, Zh., 2013, "Highly sensitive and selective colorimetric sensing of antibiotics in milk", Analitical Chemical Acta, 778, 63-69.